Ok, so let’s talk beauty. I am not a high maintenance girl. I don’t wear jewelry except for my wedding ring and a VERY rare occasion some earrings or something. I don’t wear expensive makeup or have expensive monthly hair-dos. I don’t spend much on clothes, and I wear flip flops that cost two bucks in the spring at the Old Navy Sale. I don’t spend much on me. I do love to get a pedicure, and given my lack of shoe wearing I kind of feel like it is more of a public service than a self indulgence. One of the things that I have started doing is getting my eyebrows threaded. I used to get them waxed, but I have fallen in love with threading. It last longer, and I don’t feel like I lose a layer of skin every time I need my eyebrows to brought back into submission. SOOOO, today Jp was home for a minute and I had to run to the bank which is right next to the threading lady. I thought I would run in and get those little suckers tidied up. The very nice lady has been talking to me about tinting my eyebrows for several months. I have very SPARSE eyebrows. They like to spread out all wide, but there just isn’t a ton of hair there. I fill in my eyebrows every day with powder to make them look darker. She told me this would eliminate the need. So, you know me, the queen of “okay, do something insane to my hair or face!” — I did let my girls Kool-aid my hair just yesterday — said.. OH sure, lets give it a whirl. I made sure I told her that I didn’t want anything too dark or crazy. I wanted it to look VERY natural. I laid back in the chair. At this point in the story, I am reminded that I am obviously TOO trusting of eyebrow professionals. 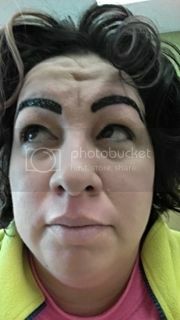 She went to work on another client. Because I am not good at sitting still, I immediately grabbed my phone and started messing around on it. Then, I caught a glimpse of myself in my phone screen. At this point, I am not wearing my glasses, but I shot straight up in the beautician’s chair. I wasn’t even aware that my abdominal muscles were functional anymore, but they did their job as I flew vertical. I was not even wearing my glasses and I could see the marker inspired lines above my myopic eyes. I instantly burst into a horrified laughter. I couldn’t help myself. This of course panicked the poor eyebrow girl. She started wiping. And the amount of wiping she did, I was pretty sure my panic was unfounded. I thought she surely is taking it all off now! Well, I was wrong. I still looked like a little old Italian woman tried to duplicate her eyebrows with a Magic marker on my face. She went back to wiping. I had to go home. I could take no more. Plus, I was pretty sure that I didn’t have any skin left under the dye. On a totally unrelated note, I just want you to know that I have changed my hair style a bit. I decided it was time to comb my curls forward. I think it is a bit more… modern… or something.